The use of analgetics and sedatives for the treatment of pain, anxiety, and agitation is a daily challenge in the intensive care environment. It is usually needed for the mechanically ventilated patient. To achieve a sufficient level of patient shielding while minimizing side effects and a short and cost-effective weaning period, the algorithm for analgosedation (AS) is an important task for the clinician. Emphasis should be placed on the consequent and correct implementation of a concept while the details ofthe concept are not as important. Another key aspect is the regular documentation of the indication for continuing AS, the definition of a therapeutic goal, the assessment of the patient's degree of agitation and pain, and finally the adjustments in the drug therapy. If the underlying diseases permit, a regular daily suspension of the AS is advisable to evaluate the patient neurologically and discover a prolonged effect of the AS (Martin et al. 2005). There are manifold causes of pain in the intensive care environment: preexisting disease, invasive procedures, trauma, monitoring and therapeutic devices (such as catheters, drains, noninvasive ventilating devices, endotracheal tubes), routine nursing care (airway suctioning, physical therapy, dressing changes, patient mobilization), and prolonged immobility. Unrelieved pain leads to inadequate sleep, causing exhaustion, disorientation, agitation, stress response (tachycardia, increased myocardial oxygen consumption, hy-percoagulability, immunosuppression, persistent ca-tabolism), pulmonary dysfunction through localized guarding of muscles around the area of pain and a generalized muscle rigidity or spasm that restricts movement of the chest wall and diaphragm. The causes for anxiety in the intensive care unit can be secondary to an inability to communicate due to continuous noise (alarms, personnel, and equipment), continuous ambiguous lighting, excessive stimulation (inadequate analgesia, frequent measurements of vital signs, repositioning, lack of mobility, room temperature, sleep deprivation, and the underlying disease that led to ICU admission. 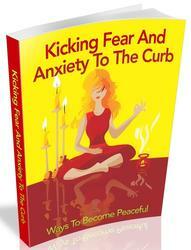 Causes for agitation include extreme anxiety, delirium, adverse drug effects, and pain. If agitation is present, it is important to identify and treat any underlying physiological disturbances: hyp-oxemia, hypoglycemia, hypotension, pain, withdrawal from alcohol, and other drug effects. Special attention should be paid to the treatment of agitation, because it can pose a serious threat to patients by contributing to ventilator dyssynchrony, increase in oxygen consumption, or inadvertent removal of devices and catheters (Jacobi et al. 2002). 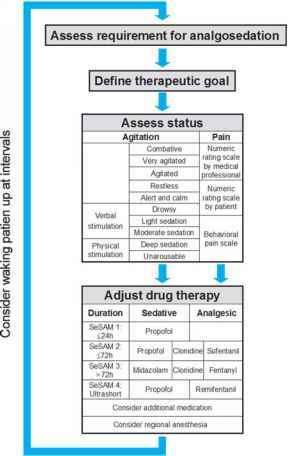 Before the start of analgosedation, it is important to assess the indication and define a therapeutic goal. Today the patients in the intensive care unit should react adequately to verbal stimulation, perceive their environment, communicate their needs, and tolerate the diagnostic and therapeutic measures. restless patient the numeric rating scale (NRS: 0 = no pain to 10 = highest pain possible) assessed by the patient himself is applicable, and for the agitated to fighting patient the NRS rated by a medical professional (physician or nurse) is applicable. For details of the assessment of agitation and pain, please refer to Tables 3.6 and 3.7.
restlessness or agitation (score +1 to +4 using the criteria listed above, under "description")? sustained for more than 10 s (score -1). not sustained for 10 seconds (score -2). rubbing sternum if there is no response to shaking shoulder. or continuous femoral nerve block. With the use of regional anesthesia techniques, a dose reduction of opioids and their side effects can be achieved. Spinal-applied local anesthetics provide sympathicolysis with improved bowel function and less postoperative ileus. A drawback of the continuous regional anesthesia techniques is the risk of infection at the puncture site and the risk of spinal hematoma formation, when a hypocoagulatory state is caused by disease or treatment with antithrombotic agents (therapeutic anticoagulation). Table 3.8. Drugs for analgesia, sedation and vegetative attenuation. On usage of Ketamin-S cut dosages in half. All dosages refer to a middle aged adult of 60 - 80 kg. Table 3.9. Co-medication to analgosedation. See Tables 3.6 and 3.7 for the assessment of agitation and pain. At regular intervals (e.g., once every 8-h shift), the algorithm for assessing sedation, pain, and agitation should be followed again. function and its determinants are uncertain and have not responded to treatment. • Class IIa (weight of evidence/opinion is in favor of usefulness/efficacy): surgical procedures in patients at increased risk of myocardial ischemia, myocardial infarction, or hemodynamic disturbances. Transesophageal echocardiography (TEE) enables the experienced examiner to evaluate online the morphology of the anatomic structures of the heart and the large vessels, contractility of the ventricles, and blood flow. 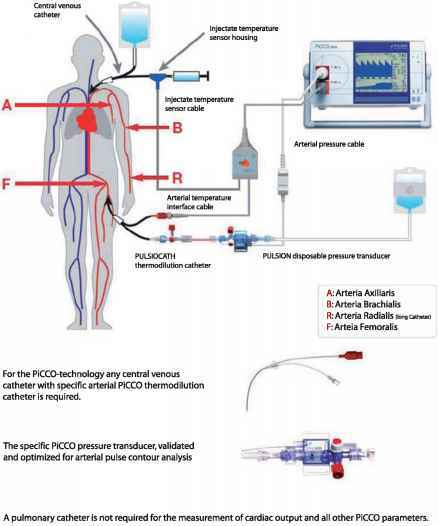 With the PiCCO-system, cardiac output, the stroke volume index, the heart rate, the mean arterial pressure, the systemic vascular resistance, stroke volume variation (indicator of volume deficit), and left ventricular contractility can be measured continuously with a relatively noninvasive device. First a special arterial catheter must be placed in a large arteria (e.g., the femoral artery). This catheter has two functions: it has a transducer to measure the arterial pressure and a thermistor for the registration ofchanges in blood temperature for calibration. Second, a regular central venous catheter is needed to calibrate the system. After the setup, it should be calibrated at regular intervals (e.g., every 8 h), and changes in central venous pressure should be entered into the monitor to allow calculation of additional parameters. Please refer to Fig. 3.8 for the configuration of the PiCCO-system, to Table 3.10 for the overview of the complete parameters of the PiCCO-system, and to Fig. 3.9 for the decision tree and the therapeutic suggestions.